Black Panther's Homeland Of Wakanda Sounds Like The Ancient African Kingdom Of Mutapa : Goats and Soda The action hero lives in the imaginary nation of Wakanda, the most technologically advanced society in the world. Is there a basis for it in African history? Editor's Note: This story was originally published in May 2016 and has been updated. Between the booming box office and the effervescent reactions of young fans, it's clear that Black Panther is a pop culture force to be reckoned with. For new fans, here's a quick overview of the character's backstory: Black Panther's real name is T'Challa, and he's the king of the African nation of Wakanda, the most technologically advanced society in the world. Wakanda is enriched by "vibranium," a mineral deposited by a meteorite crash. Black Panther's powers (enhanced senses, speed healing and infinite knowledge) are derived from his connection with ancestors and deities. When he's not assisting the Avengers in New York or completing his doctorate at Oxford (he's a busy guy), Black Panther works tirelessly to protect his kingdom. The Black Panther enjoys an outing on the water in this illustration from his comic book. There are different theories about the real-life inspiration for Wakanda. Ta-Nehisi Coates, who authored a reboot of the Black Panther comic series, explained his in this post for The Atlantic's website. But the actor Chadwick Boseman, who plays Black Panther on screen, told The New York Times that Wakanda is a fictional version of "the Mutapa empire of 15th-century Zimbabwe." "Mutapa operated on three basic levels: they had a capital city, provinces and little villages," says Professor Angelo Nicolaides of the University of South Africa. Chiefs ruled at each of these levels under the supreme authority of the king, known as the Munhumutapa. According to the Princeton University Library, this map from 1635 shows the northern boundary of the kingdom of Mutapa (aka Monomotapa) as the Mountains of the Moon (Lunae Montes) — they're in the center beneath the large body of water. Like so many other kingdoms that believed in the divine right of kings, "the Mutapan people believed that their leaders were placed in positions of authority by the creator," says Nicolaides. "The oral tradition tells us that they were involved in ancestral worship to a large extent, and the people believed that the kings had a very good relationship with the spirit world." If the kingdom of Mutapa had a superpower, it would be a staggeringly effective trade system. 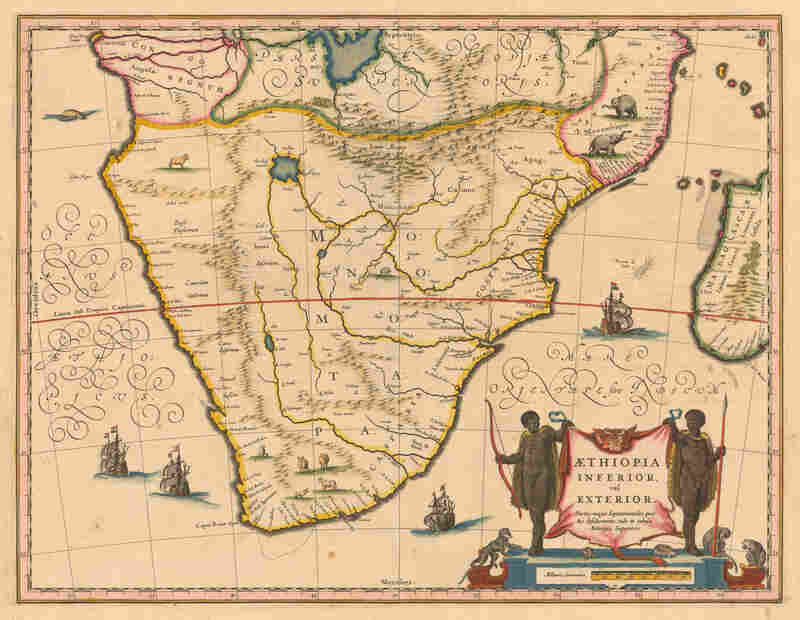 "Most kingdoms in Southern Africa are known for their military might and great dictators," says Edward Mabaya, associate director of Cornell's International Institute for Food, Agriculture, and Development. "Mutapa stands as a symbol of economic success through local, regional and international trade." Mutapa's equivalent of Black Panther's precious "vibranium"? Gold. And lots of it. "They had resources of very rich gold in the valley to the east of modern day Harare in Zimbabwe," says Nicolaides. The king maintained ownership of all the mines in Mutapa, the exact locations of which were kept secret under penalty of death. In addition to gold, he says, Mutapa's most valuable resources were ivory, salt and cotton. Mutapa traded extensively within its own borders, but the kingdom also established prolific trading networks with Europe, Asia and northern Africa. Archaeological excavations have uncovered Chinese porcelain, Indian beads, and Portuguese cloth in the Mutapa region. That's an especially impressive feat, explains Mabaya, when one considers the geographic limitations of the area. "Mutapa is not on a major river or ocean that would give it natural advantage for transport infrastructure." Through bustling local bazaars and strategic partnerships with Portuguese traders along the coast, "Mutapa was able to achieve unparalleled trade against all odds for about three centuries." During the height of its trading boom, Mutapa seemed nearly as invincible as its comic book counterpart. In the end, a combination of factors led to its downfall: infighting between provinces, overmining, religious clashes caused by village chiefs converting to Christianity, and forceful takeovers of resources and trading stations by the Portuguese — to name a few. By the mid-1700s, the Mutapa empire had crumbled amid a civil war. In the coming weeks, millions of moviegoers will watch Black Panther try to save Wakanda from meeting the same fate. Amidst all the superpowers and special effects, Mabaya says there's an important lesson to be learned from the real region that inspired Black Panther's beloved homeland: "I think the Mutapa kingdom is a great reminder of contemporary opportunities and threats facing Africa."